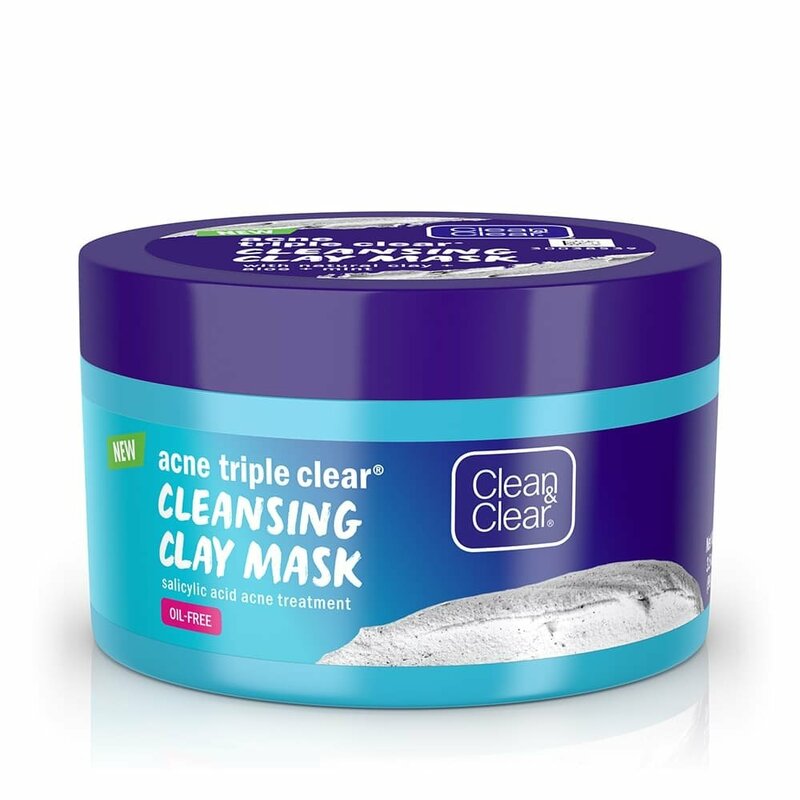 CLEAN & CLEAR® Acne Triple Clear® Cleansing Clay Mask is a natural clay face mask that absorbs pore-clogging oil and cleans deep into the pores. Salicylic acid, a proven acne-fighting ingredient, treats and helps prevent breakouts, while the aloe and mint formula contains the nourishing skin conditioner glycerin to help soothe and invigorate skin. The acne-fighting mask treats breakouts in three ways: by absorbing excess oil and washing away impurities, by treating pimples without overdrying skin, and by helping prevent future breakouts. To use as a cleaner: Can be used twice daily. Wet face. Apply to face and massage gently. Rinse thoroughly. To use as a mask: Do not exceed three times per week. Smooth an even layer over skin. Allow to dry up to two to three minutes. Rinse thoroughly. If excessive drying or bothersome peeling occurs, reduce application to once per week (mask use) and every other day (cleanser use). We'd love to hear more about what happened. Give us a call at 1-877-754-6411 Mon-Fri, 9am-530pm ET. Hope to hear from you soon! I usually don't have a problem with breakouts but when I do get a blemish it's usually a bad one . But, this product helps it clear up faster and helps the breakouts not be as frequent. It works great! It doesn't dry out my skin, treats the acne and smells great. I will definitely be buying this again. I used this mask last night for the first time & my face is so AMAZING !!! I felt confident enough to go all dat without any makeup at all. My big pimples I bad by my jawbone REDUCED in size so much & the discoloration almost disappeared. My skin has been so irritated and broken out since I’ve used this product one time. Will not use again! Oh no! Our products should be tough on acne, not on your skin. We'd really like to learn more about this. Please give us a call at 1-877-754-6411, Monday-Friday from 9:00AM-5:30PM ET. We look forward to chatting with you. I bought this on a whim going down the acne section and wow, I regret not getting two! It shrinks down my acne that sprouts during that time of the month and helps clear it up faster. I love using it as a mask because it leaves my face feeling nice and soft. Love love love it! I was very skeptical about buying this product since it was new. I did not like the price and I was so unsure if it would make a difference for my skin. I read the ingredients and I know that less is usually better so I said I will see if it works. I was shocked the first time I used it. I could tell the difference. I had a huge pimple on the side of my face and I felt it pulsating so I knew it was going to be no longer on my face. I am so glad I bought this product. I want to buy more jars. Please keep this product and do not change the formula because it does work. Thank you!